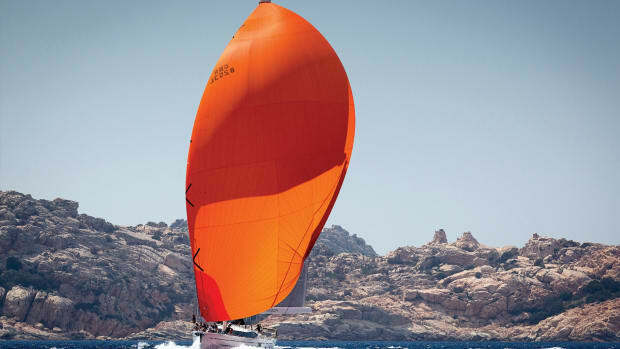 It’s no secret that J/Boats is an industry leader when it comes to fast, innovative sailboats; the retractable sprit pole introduced with the J/105 gave new life to the asymmetric spinnaker, and the company practically invented the sport-boat genre. 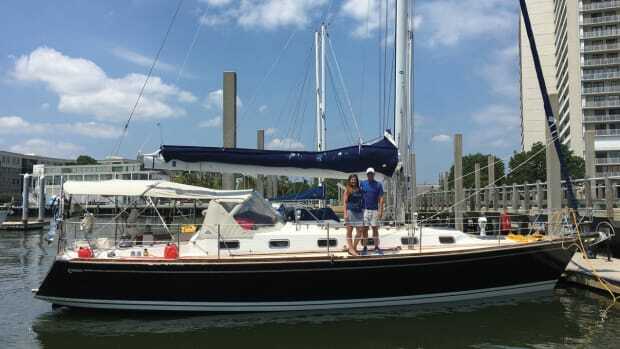 Now the Rhode Island-based company has done it again, this time with the sporty J/95, a 31-footer with twin rudders, a retractable centerboard, a near-plumb bow, fine entry, low freeboard, an open transom, and yes, a sprit pole (optional).The twin rudders and the centerboard are the biggest departures from previous J/boats. 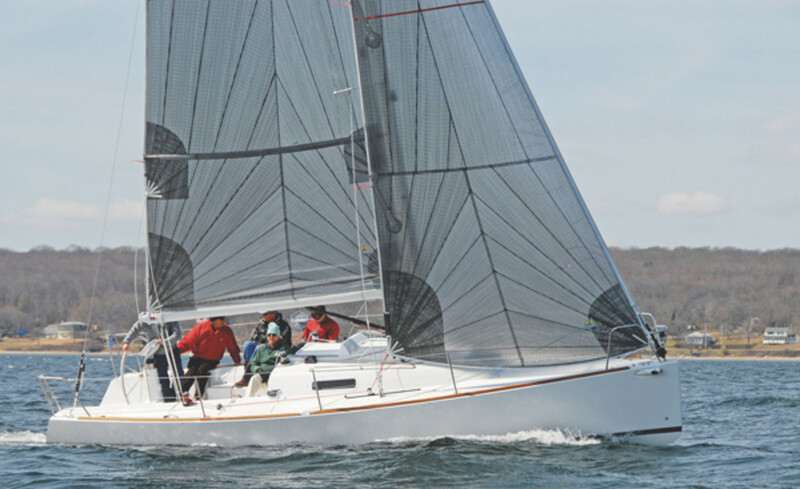 The J/95’s stubby fixed keel draws just 3’ but carries more than 90% of the ballast, so the boat can safely sail upwind with the foil-shaped bronze centerboard raised; the pivoting board increases draft to 5’6”, improves tracking and provides some additional stability. 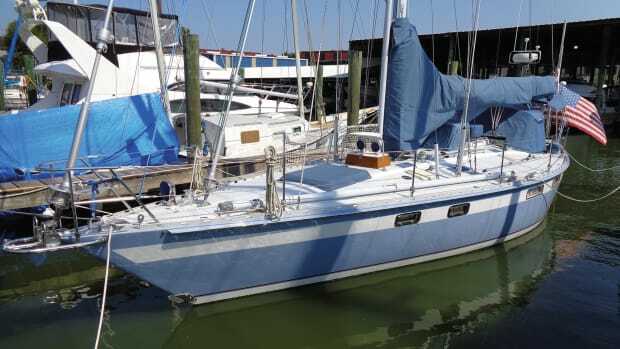 I sailed hull #1 two days after it was splashed in March, in 12 – 14 knots of wind and flat water off Portsmouth, Rhode Island. While the day was chilly, the boat’s performance was hot enough to keep everybody comfortable, including Rod himself. The hull and deck are sandwich constructions of bi-axial and tri-axial e-glass fabrics and polyester resin, with an end-grain balsa core. Resin is vacuum-infused into the layup of the hull, deck, and main bulkhead, which is bonded to the hull and deck to support the chainplates. 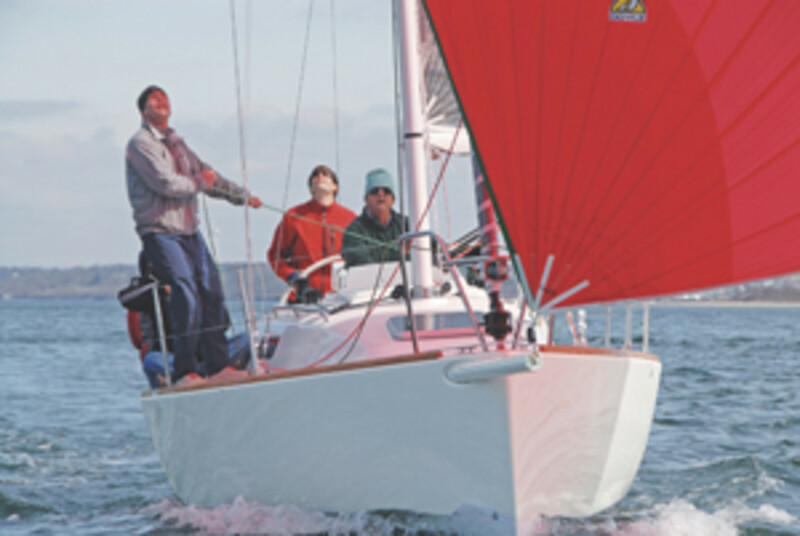 A vinylester barrier coat is applied behind the boat’s gelcoat finish to prevent blistering. A structural grid with longitudinal and transverse support beams stiffens the hull. The 2,250-pound lead keel is bonded and bolted to the hull’s shallow-molded sump, and the 200-pound bronze centerboard is controlled by a tackle system from Hall Rigging. The first thing you notice is the generous cockpit. 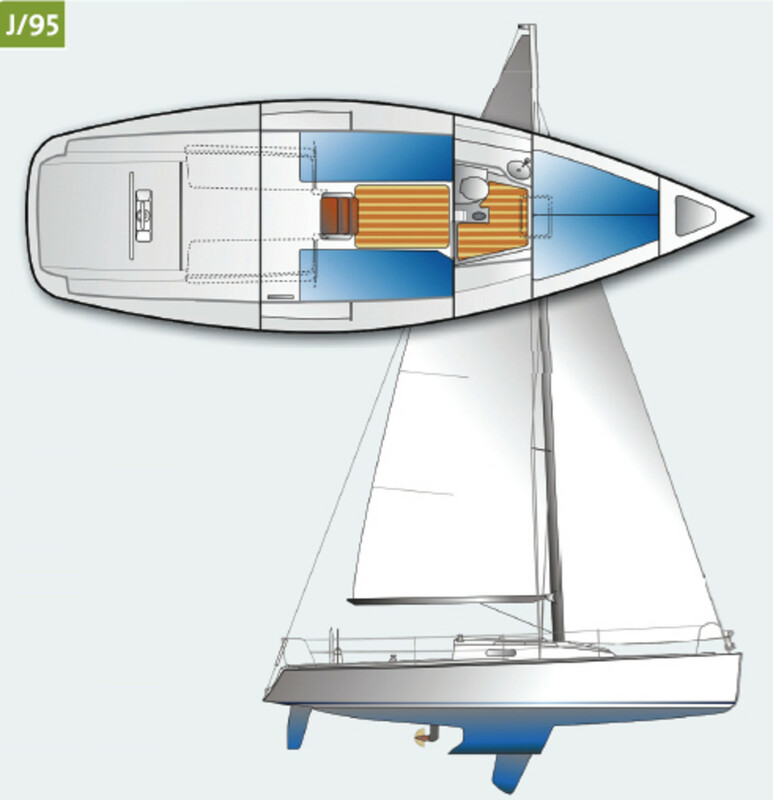 The open transom can be enclosed by an optional locker/helm seat. 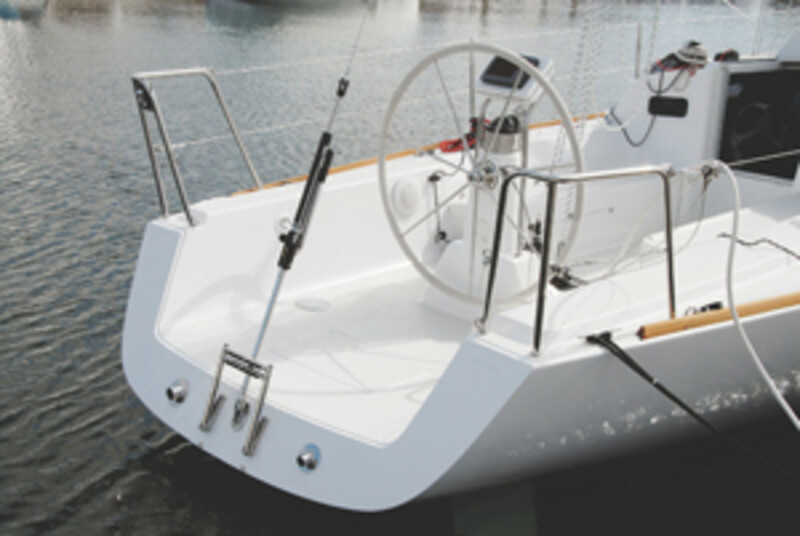 A cockpit-mounted traveler, a single 44” destroyer wheel, clean sightlines, and an optional teak toe rail that extends the boat’s length make it easy to sail the boat and work the deck. Four Harken winches (two 40.2STA primaries and two 32.2A halyard winches) control the running rigging, and are supported by two sets of Spinlock XTS triple rope clutches; a Spinlock XAS clutch on the starboard side of the house controls the A-sail’s tack line. Our test boat was equipped with an optional Hall Spars carbon-fiber 9/10 rig with swept spreaders, rod rigging, and an aluminum boom; an aluminum mast is standard. Hull #1 did not yet have foot chocks by the helm, but these were already on the work list. Visibility was excellent and the narrow shroud base made accessing the foredeck simple. While the J/95 is offshore-worthy (it carries a CE Category-A rating), its Spartan interior highlights the fact that, as with all J Boats, accommodation takes a backseat to sailing performance. There is no galley as such (a pressurized freshwater system with a 20-gallon tank is optional), nor is there standing headroom or a table, but the two full settees are long and wide enough to accommodate large crewmembers. The semi-enclosed head with a sink (a working faucet is optional) is situated forward of the main bulkhead. 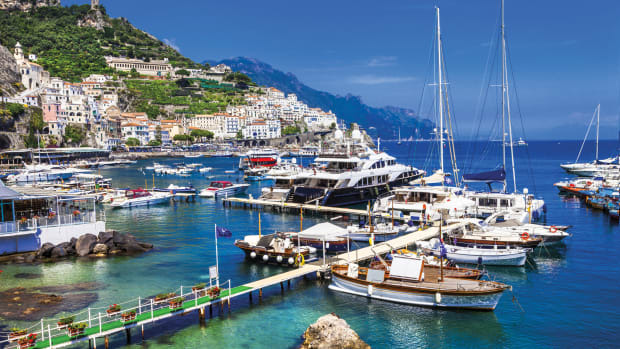 Stowage is limited (there are bins outboard of the settees, as well as aft storage lockers), but, given that most owners will use the boat primarily as a daysailer or an occasional weekender, this shouldn’t be problematic. There’s a synthetic teak and holly cabin sole in the main cabin and the head, and a bare minimum of wood trim. 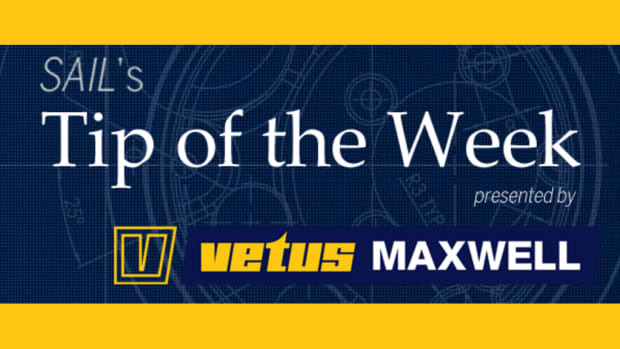 I knew the boat was a performer when I looked at the speedo and saw we were making 4.8 – 5 knots of boatspeed under mainsail, with the centerboard raised. Once we lowered the board and rolled out the 105-percent headsail our speed climbed rapidly, leveling out in the high 6’s and low 7’s. The centerboard is cleverly rigged and controlled via the port cabintop winch and one of the jammers. With the board down, the boat pointed aggressively and easily tacked through 80 degrees. I had feared the twin rudders would make the helm feel sticky, but quickly found that the Edson steering was both light and responsive. Johnstone demonstrated that the boat can go from hard on the wind to practically dead downwind in a single boatlength, commenting “that’s the beauty of two rudders.” Off the wind, with the centerboard raised and the masthead kite filled, the boat had no trouble hitting high 8’s. Gybing was easy, and that same light, responsive helm remained, even while sailing deep angles. While the J/95 is “only” 31’2”, the directional stability provided by the twin rudders gave me the impression I was steering a boat at least five feet longer. The only flaw I found was the location of the sheet tracks, and that’s already been remedied.  Given that we had perfect conditions for our test, we had little reason to use the two-cylinder, 14-horsepower Yanmar saildrive engine, aside from maneuvering away from the dock and out of the short channel into Narragansett Bay. That said, we had no trouble getting up to 6 knots of boatspeed at about 3,100 rpm. The boat is a dream to steer, and the cockpit ergonomics are both family friendly and well-organized for racing. 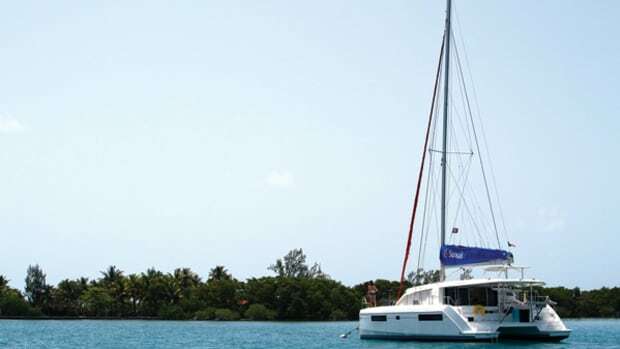 Its ability to sail in shoal waters will open up new cruising grounds. The twin rudders make it highly maneuverable yet with no hint of the twitchiness that plagues some high-performance boats, and the centerboard is easy to use and operate. 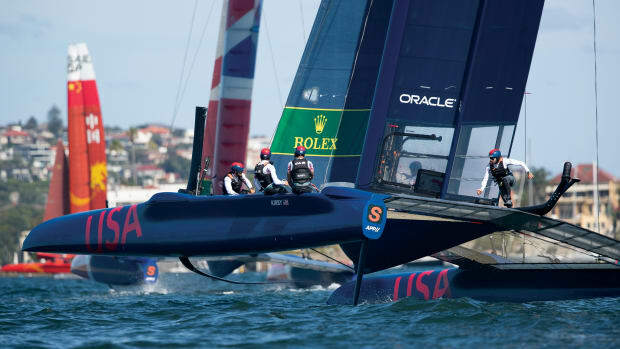 It will be interesting to see how the boat measures up on a racecourse; it could make a great one-design class. If you live near shoal waters, this is a boat that was designed with you in mind; and even if you don’t, the J/95’s lively performance will charm you anyway.